Contemporary cuisine in a glass-walled sanctuary by the Pacific --- the daily prix-fixe lunch won't break the bank. 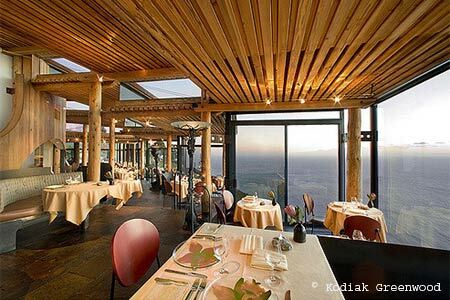 : Sierra Mar, Post Ranch Inn’s glass-walled sanctuary that hangs impossibly over the Pacific, is a showcase for fine dining. Chef John Cox forages for local ingredients to feature in his “micro-regional” cuisine. The menu changes quarterly, with such dinnertime first courses as Morro Bay oysters on the half shell or a tasting of local fava beans, perhaps progressing to local black cod or rack of lamb and, finally, a selection of artisan cheeses. Diners don’t have to drive in the dark along the highway at the edge of the world or drop a bundle to enjoy a little luxury. A daily prix-fixe lunch menu means guests can enjoy the view and the food for $55 (plus an additional $29 for wine pairings), including a starter such as house-cured goose prosciutto, an entrée -- think fennel crusted yellowtail tuna or pineapple sage braised pork cheeks -- and dessert such as butterscotch crémeux or Caramelia chocolate brownie with bourbon ice cream. If you’re looking to dine with a larger party, the Library can be booked for up to a dozen people.